Crystal Singing Bowl for Me Please! I need a Crystal Singing Bowl and I want it now! Yeah, Mariuca is in a demanding mood and insists on peace and quiet tonight! My baby cat Phoebe is "in the mood" again and for the past four days, she's been meowing and shrieking like no tomorrow. She is driving me up the wall with all the noise she's been making, day and night! To make matters worse, I spotted a Mr. L (Lizard) yesterday and those who know me well will surely understand my fear of being trapped with a slimy Mr. L lurking around inside my home; waiting for the right moment to appear and pounce on me! All this plus my new technical translation job, which seems never-ending, is stressing me out! What I need right this minute is the soothing sound of Crystal Singing Bowls to soothe my weary soul as I escape into a whole new world of pure relaxation. Made from 99.9 percent pure quartz crystal, Quartz Crystal Singing Bowls make a wonderful therapy in terms of healing and meditation. Did you know that our bodies are also composed of a crystalline structure, which is why crystals are a key element in many different holistic medicine healing practices. 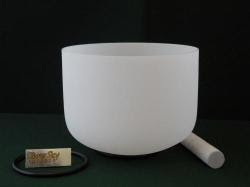 Emitting the sweetest of soothing tones, these Crystal Singing Bowls helps to relieve mental and physical ailments; diffusing them out of your system; allowing you to relax and heal mentally. It also serves as a great relaxer for standard daily meditation and deep relaxation, which is exactly what I am in dire need of tonight! Do you have a crystal singing bowl? Care to loan it to me for a week? yiha!!... oh no. pheebss is come the shrieking mode.. bila you sunat dia tu.. cian dia.. stress tu.. eheh..
at least no monkey around you GP! .lol!!! Come on FC3, hurry up! Tensi la LJ dgr Pheebs meraung2, kan we’re not sure if wan to sunat her on wan to have pheebs babies he he, so blm sunat lagi. Actually past 6 months she’s been great, langsung tak bising only recently je start meowing again! Yeay.. FC2.. lets do the dance GP!! Hahahahaha yeah I agree, I’d rather have Mr. L than Mr. Mo around yowzaaaaa! I bought the lizard spray edi, tested it out just now on a baby Mr. L, but haven found the other Mr. L yg remaja tu aiyoooooo! You got FC2 dearie, awesome! Oh no wonder lah.you wan pheebs babies. heheh.. nak jadi granny eh you..
Yay for buzz buzz woo hoo! I dropped 900 cards today Mon yay! Yeah.. the new place have Mr L and Mr Mo!!! Aiuyoop!!! She wants a boyfriend Mon!! Ha ha hey u didn get this opp from RM, Mon? Expensive la this crystal singing bowl, 185 bucks! He he no don have calon BF, but I’d love for Pheebs to have a cute fluffy white BF! Fuyoo, mesti anak choms gils! She wants a BF Mon, so acting up, haven sunat her yet lol! Hahahhah.. lets dance Mon.. GP!! Haahhahaahhaha.. Mesti chomel like the late mufasa like that.!! Hahahahaha. she mengamuk tu.. dia golek2 tak GP? too bz writing my Transformers movie review Marzie!!! I watched it just now, 9pm show.. sneak peek!! :) :) I agree with B!! It was awesome and definitely my fave movie this summer!! tell you.. lol! .padan muka.. after that got to wash Smokey's paws lah..
Alah.. smokey cannot already lah.. hehhee.. lost cause.. lol! i remember u did this one b4 oso right? Another point for me, catch up LJ! U not in my Top 3 lol! Yeah Mon, have to make up for yesterday and day before ha ha, so I started early yay! Tulah.. been sleeping early mah.. now can catch up.. write more post GP!! Yay it’s me, LJ and Mon again tonight! Now if only SS gives us another PB, then we can relive yesterday LOL! Mesti comel and fluffy mcm alien! Meow! Golek2 gila Lj!!!! Now she’s inside the room, the other 2 outside, cause cannot tahan she’s so noisy lol! Ahhaha.. that would be awesome.. kamon lah SS! Yeah Mon, she wants a BF he he…. Meowing away like there’s no tomo! He he yes I did Mon, dat time I didn know what’s a singing bowl, now I know LOL! U oso didn’t what LJ? Didn get this opp?? Kamon SS! Another 20 bucks PB por favor! He he mata besar pas tu kepala bulat and fluffy! Ha ha yay to RM crystal singing bowl PBs then Mon! We learned something new lol! LOL @ LJ don wan to become grandma hahahahhaah! He he don forget the baby bedding RM PB too! Can see from ur unit Shemah? What happened?? yeah nothing at SS! what PB program is that Mariuca? then BAM BAM BAM BAM BAM.. then it was silent.. and ran to all the windows..
to see if I can see anything.. and finally saw what I thought was debris. the car or the wreckage. I edi submitted MD for link worth and blog to profit, now wanna submit to BV and maybe SR! OMG, that’s terrible Shemah! Dia naik kereta or what? So is he okay, the guy I mean???? Lambat betul ambulance sampai, what is up with that? :( I hope the guy is okay Shemah!!! Oh car accident OMG, dia tercampak keluar Shemah? Must be so scary, hugs sweetie. Lucky the kids dah tidur ye? they didn't take out newspapers. practically dive across J to get my charger!! Masa I nak call my batt died!! but I couldn't see the car anywhere! and no one wanted to stop. So paranoid lah the ppl nowadays! yelah so pity the guy there.. did u go down and take a look Shemah? Hhahahaah setengah jam!! Sorry 30 mins!! LOL! Ppl cant help being paranoid cause of all the violence nowadays Shemah, but nasib ada jugak yg stop to help. Kesian la the guy! newspaper.. and we saw a little bit of movement..
Hahahhahah tu la I pun ingat kat mana u duduk ni 30 JAM to get to KLIA lol! ambulance made J look like a race car driver..
No lah mon!! I just look from the window only. LOL! Oh that’s good to hear Shemah! Dah la dekat dengan rumah u! Sorang je ke Shemah? No passengers? J slow poke driver? LOL! Takpe biar lambat, asalkan selamat! children. But slowpoke tak slowpoke.. other drivers drive macam hantus!! mrs marzie, I need some help to get my new site reviewed, but before on I get review from blog, I need some personal review from you first..
That’s true Shemah, drivers nowadays mcm aksyen gitu, both females and males, podah la! Hahaah!